The word challenge at Scrap Our Stash this month is INKS. If we set aside the word for just a moment, I have to say that I love this challenge more and more every month. I really dig deep into my stash and find things I can use up and throw away the packaging, and in the process I find treasures I can use on new layouts. I love, love, love their word challenge. This is what my word INKS looks like .. I was so happy to get these photos of GB as a young boy visiting Santa scrapped. Because the photos were taken when he was little, I didn't think he'd have enough memories of this time to warrant three individual layouts. Boy was I wrong LOL! He thinks I'm a terrible nag LOL, hearing "I need your memories for the journaling" over and over until I finally get them. 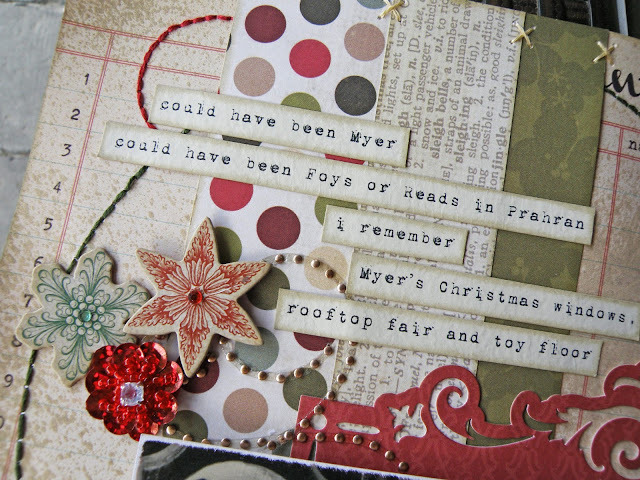 But then when the layout is finished, he's ever so pleased to see his memories written down. Anyways that's probably enough waffling! If you think you'd like to give this challenge a go yourself you can find all the details HERE. OH MY OH MY! What a FAB-U-LOUS Layout!!! 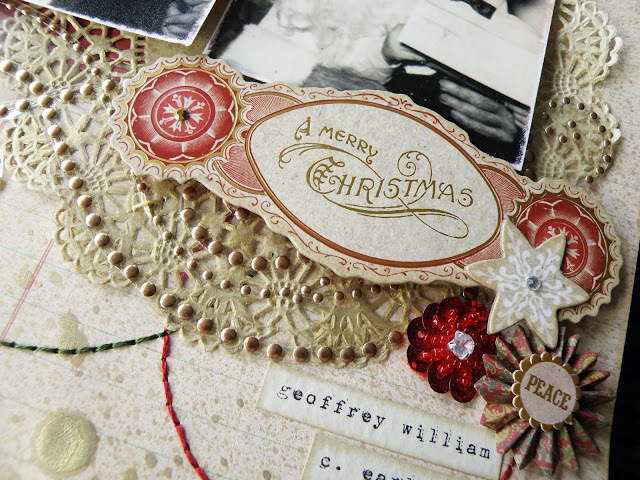 The journaling, the stitching, the whole vintage feel to go with the photos!! Great job on the INKS challenge - I LOVE the word challenges too! Thanks for playing along with us at Scrap Our Stash - DT Sherri! Amazing! Such a beautiful layout. I love everything about it! Excellent choice of stash items to complete our challenge! Thank you for playing along with Scrap Our Stash! Gorgeous, as always! Love all the textures and layering and attention to detail. The stitched circles are amazing! Thanks for linking up @ SOS!! Totally gorgeous layout. Wow love those details and stash used. Great selection and cute pics. 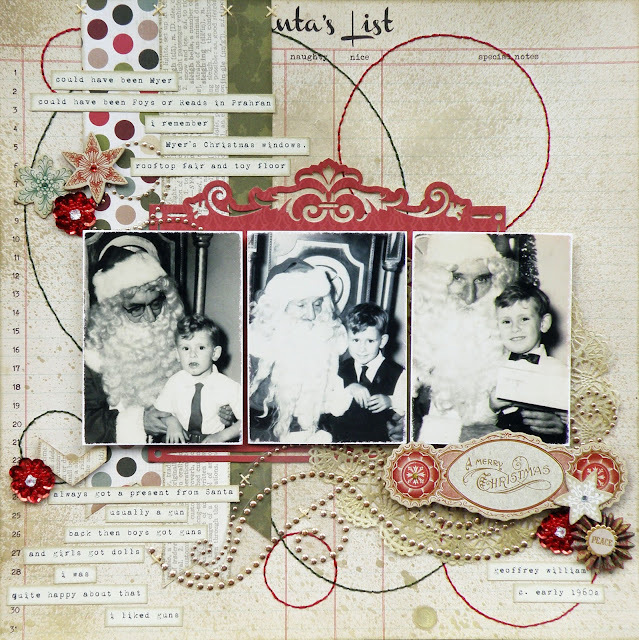 Thanks for your entry is our challenge at Scrap Our Stash! 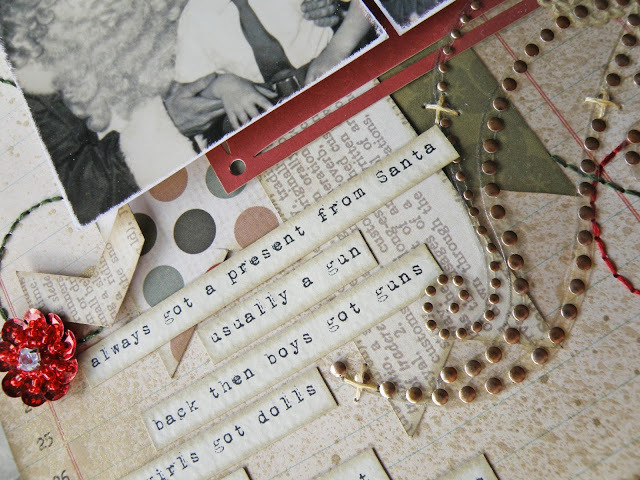 Love the details and embellies used on your page! Thanks so much for participating in Scrap Our Stash! WOW! Your layout is absolutely gorgeous! I love all of your amazing touches and details. And the way you used the items in your stash, too. Thank you so much for joining us at Scrap our Stash this month! Wow! Such an awesome christmas layout. Love it. Thank you for joining us at Scrap Our Stash.